While running the risk of sounding like a Hello! 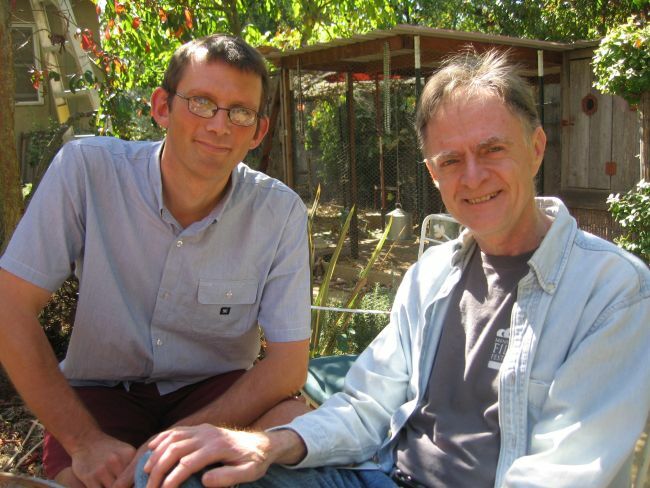 Magazine reporter, I must introduce this post by saying that while in the US recently, I joined Richard Heinberg and his wife Janet in their beautiful permaculture garden in Santa Rosa, California. Richard will be known to most readers of this blog as the author of The Party’s Over, Powerdown, The Oil Depletion Protocol, Peak Everything, Blackout and Snake Oil as well as one of the best communicators on the whole peak oil/everything question. 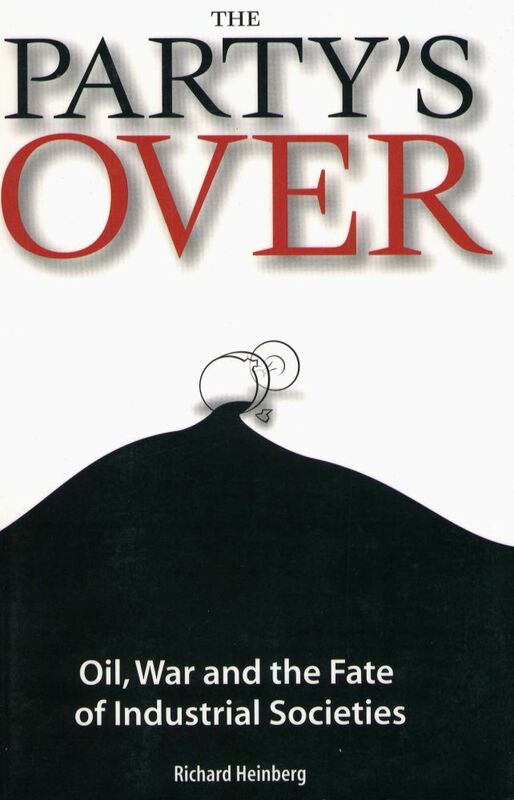 This year marks the tenth anniversary of the publication of The Party’s Over. Richard has already reflected on this in September’s Museletter, but Richard and I pulled up a chair under a tree in his garden and chatted more about the book, its impact, and other related issues. You transcript follows below, or you can listen to or download the podcast below. So Richard, it’s 10 years since The Party’s Over came out, which is certainly a book that turned my life upside down and the lives of many others, I suspect. This guy came up to me at an event I was at recently in Austin, and said “I read your book 4 years ago and after I read it, I gave up the really well-paid job I had and I moved into a falling down house.” I thought, my God he’s going to burst into tears! But it was a story that ended well. What’s your sense, looking back on that book, knowing what we know now and how things have changed through the explosion of unconventional stuff, how well, looking back after 10 years do you feel that the analysis set out in that book has held up over that time? Since it is the 10 year anniversary of publication, I actually went back and read the book for the first time in years. I was actually quite pleasantly surprised. In the book, although I cite the analysis of a number of different people, theorists if you will, the two people whose work rely upon most are Colin Campbell and Jean Laherrère. If you read carefully what they were saying in 1998, and the next few years, what’s actually transpired since then is essentially exactly what they were forecasting. They were forecasting a peak in regular, conventional oil around 2006 or so, which is exactly what we’ve seen. Yes, crude oil production has increased in the last few years, but all of the increase has been in tar sands or tight oil from North Dakota and Texas. If you take that out of the picture, oil production today is below what it was in 2005-2006. So that’s correct. And they went further and said this would cause price increases which would incentivise more production of unconventionals. They didn’t specifically say we’re going to get more oil out of North Dakota, but how specific do you need? To my interpretation, what they were describing was exactly what we’ve been living through over the last few years. We’ve seen higher and more volatile oil prices, the oil industry is spending twice as much on exploration and production and yet producing very little more oil. They’re drilling twice as many wells and the 10 top oil companies have seen their actual production decline by about 25 % in the last decade. So if this isn’t peak oil I don’t know what is. Now it’s true, there are some peak oil commentators who were saying that the result would be an almost immediate global economic crash and there’d be riots on the streets and mass starvation and so on before 2010, and that hasn’t happened. But if you pick up The Party’s Over and read it, there’s nothing in that book that would make such a claim. The idea that the ‘party’ is over that’s so strong in the book, there seems that the book has motivated lots of people for whom the working assumption is that the party’s over, but our leaders are still desperately clinging to the fact that the party is revivable and is about to start swinging again with great gusto, based on this obsessive push for growth and what it takes to make that happen. What’s your take on this scale of denial or over-optimism that is gripping our leaders at the moment? I wouldn’t characterise their attitude as one of optimism. I think their attitude is veering more and more toward desperation all the time, but it’s a failure of imagination. They cannot imagine a Plan B. The only definition of success in their lexicon is more economic growth as in what we saw during the mid-20th century. Of course, that’s just not on the cards. That presents an impossible situation for them. All they’ve managed to do so far is – and here it’s not only governmental leaders but also heads of central banks – to create a few years of fake economic growth through massive deficit spending and quantitative easing and so on. That’s staving off economic collapse, but it’s certainly not capable of returning us to the glory days of easy economic growth. I think there’s a general understanding that this can’t go on forever, that there are inherent problems to deficit spending and central bank enlargement of the balance sheets of the Federal Reserve. That can’t go on in perpetuity, but what else do they do? I described this in one recent essay as fingers in the dyke. With unconventional oil and with quantitative easing and deficit spending, we’re managing to maintain a façade of normality, at least for a large segment of the population. Certainly not for everyone, because every year more and more people fall off the edges of the table. But at what price, in the long run? The longer we try to maintain this false normality, the higher the cost in the end. The worse the crash will be once these back stops fail. 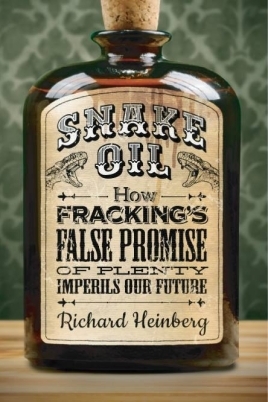 The latest book you’ve written, Snake Oil, has been looking at the whole fracking explosion, which in the UK has been a thing that the government is grasping on to, assuming that the same thing that can happen in the US can happen in the UK, and that’s how the economy is going to be got going again. But you argue there that actually fracking is a bubble, a very dangerous bubble. Could you tell us a bit more about that? Here in the US, there has been a very substantial increase in natural gas production as a result of the application of hydro-fracking to shale deposits. However, there are only a few geological formations where this can be applied and in each of those there’s only a small core area where production is prolific and profitable. The drillers have, except for one, pretty much drilled out all of those core areas and production is dropping. The Barnett, which was the first of the shale plays, where it all started in Haynesville was the largest and most productive. Before the end of the decade, probably round 2017 or so, we’ll begin to see the end of the bubble. Already, companies that got in late and missed the sweet spots are writing down assets and selling off leases. There are all the signs of a bubble bursting. Most of Shell’s assets were in liquid plays in Texas, in other words, oil. But the same principle applies with tied oil as with shale gas. We did a study at the Post-Carbon Institute called Drill, Baby, Drill. David Hughes, a retired petroleum geologist who worked for the Canadian geological survey gathered all the available data. Our study, actually, I’m very proud of it, is the best study that’s been done to date on shale gas and tight oil. It’s clear from the numbers that this is a short-term boom. Is the same thing going to happen in the UK? I think it’s extremely unlikely. Firstly because if it’s such a short-term bubble here, is it likely to be any better there? No, probably not. But second, because the ownership structures are different. Here, it’s all private landowners who stand to make a little money from drilling leases. So there’s an incentive for people to accept the noise, the bad air, the compromise of water quality and all the other things that go along with fracking. The incentive to overlook those things is they’re going to get an immediate economic bonus from it. But in countries where some surface mineral rights are owned by the government, there’s no such incentive for ordinary people. When people are confronted with these environmental and human health insults, there’s no reason why they should go along with it. There’s likely to be a much greater citizen backlash. The citizen backlash here in the US has been pretty substantial. A poll released just a couple of days ago showed that Americans are generally opposed to more fracking. So again, that kind of backlash is likely to be much greater in the UK and other countries. You and I a while ago had a debate about planned descent strategies preparing for emergency. What’s your thinking about those issues there? Could you give us an update on your thinking about that? I guess it’s the ‘Powerdown’ scenarios, ‘Building Lifeboats’ and stuff. It seems to be that the governments are dashing off over the hill in ‘Last One Standing’, ‘Drill Baby Drill’ scenarios. But in terms of us as communities, which ones do you think we’re left with; are we ‘Building Lifeboats’ or are we ‘Powerdown’-ing? We have to continue doing as much of both as we can. A few minutes ago I mentioned the fingers in the dyke scenario. We don’t know how long these back stops are going to last. We don’t know how long quantitative easing and deficit spending can go on for. It could be weeks: what’s going on with the US Congress and the debt ceiling right now could precipitate a global economic crash within a matter, literally of weeks. On the other hand, it could be years. I think we have to assume that we have time to build community resilience, but while we’re doing that, it really makes sense, as families, as individuals, to have a well-stocked cupboard. The more prepared we are as households for disaster, the more resilient our communities are. If you have a whole community where nobody has any food put by, nobody has any backup systems ready, then the whole community is much less resilient. There’s every reason for people to have a sense of preparedness. But when I say that, I don’t want to encourage a survivalist mentality. It’s quite the contrary. The big thing that the survivalists miss is that the only way we’ll get through this is together. If it’s lone individuals with shotguns then kiss the human race goodbye … game over. You mentioned the thing about what’s happening here. I’m sure there’s no connection, but the government shut down the day I arrived. I’m sure it’s not going to open again the day I leave – if it does I’ll get a bit worried! [Editors note: it did] What are the implications of that, do you think? Where could that take this country? Could it be just a couple of weeks where people don’t get paid and then it all goes back to normal, or could the outcome of it be more serious? Oh yes, it could be very serious. This is revealing a fundamental political dysfunction within the country. The insular, rightward drift of the Republican Party over the past three decades is really dramatic. One can argue whether a two-party system is a good idea, but in order for a two-party system to even work minimally, you have to have two healthy political parties. What we have now is one establishment, mainstream, centre, marginally centre-left but mostly centre political party which is the Democratic Party and one party that’s basically gone crazy. It’s boxed itself into a corner but it has a die-hard base that is so radicalised and so cut off from reality that nothing is going to come between them and their cherished nutcase candidates. They’ll support them to the end. And I know that the crazier these politicians get, the more support they have. So if you look at the incentives on both sides, they need to have a stand-off, a constitutional crisis. Surely that’s something that just happens in the White House. How does that create a knock-on that’s going to ripple through the world economy? If they fail to increase the debt limit for the US, that will have enormous implications for the global economy, certainly for the US economy. Almost immediately, interest rates in the US would skyrocket, the stock market would crash, the US dollar might cease to be the currency of account for other countries. The whole global economic financial system would be hurtled back to the days of 2008 and possibly much worse. How far can we just carry on going piling up those debts. Isn’t the Republicans saying let’s not increase the debt ceiling, isn’t there a good aspect of that? The party may be over, but we still keep on borrowing to keep the illusion going that there is a party. When is debt a good thing and when is debt a bad thing? Debt is a good thing in the present instance, only to the extent that it enables business as usual to continue for a while so that people like you and I can go about our business and try to help systemically to build more resilience in society. Buying more time otherwise is not a good idea, because it just means we’re going further out on a limb as a society, from an ecological standpoint. The argument could be made that the Republicans are doing everybody a big favour by forcing the issue, and basically forcing a global economic crash sooner rather than later. I’m a bit torn with that really. It’s a little extreme, isn’t it? 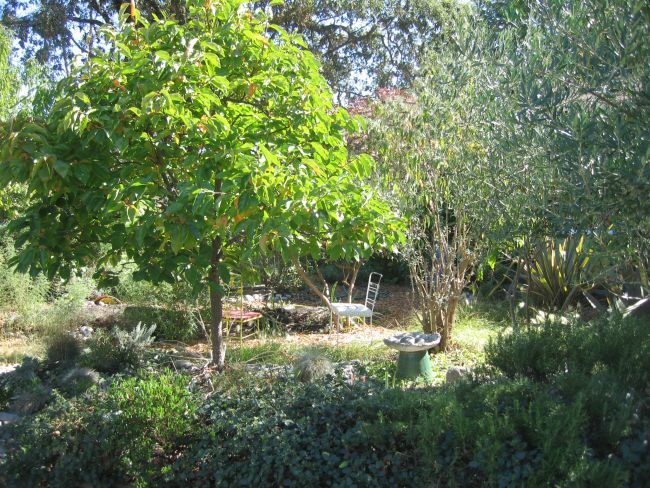 We’re sitting here in your very beautiful garden with fruit and nuts…you’ve been writing about this stuff for 10 years and been one of the world’s foremost analysts of these issues. How does Richard Heinberg’s daily life reflect those things? You’re quite clearly not one of those academics who is able to just study something and then have a life that completely doesn’t reflect that. How does all of that appear in your daily life? My wife, Janet and I have spent more than 10 years, probably more like 20 years trying to develop as much self-sufficiency and ecological sanity in our lives as possible. We’re proud of what we’ve done so far but at the same time we’re painfully aware of what we haven’t done and what’s really hard to do. We just have to content ourselves with what we can do. We’re happy to have friends and neighbours who are supportive and we try to encourage them also and work with them on all sorts of interesting local efforts like creating community energy and so on. Is it enough though? But at the end of the day, we have to do what we can and enjoy life. This life is a gift and we don’t know how many days of normal life we have. Being with friends and family, playing music, being out in the garden, spending time with nature, this is not something to take for granted. My last question is now, looking back 10 years after The Party’s Over came out, and it’s been translated into lots of different languages, are you able to get a sense of its impact, of its legacy as a publication at this stage? I wouldn’t want to try to be too bombastic about it. It’s one of a number of books about Peak Oil that have been written. I think it probably was one of the more influential ones, certainly it didn’t have the highest book sales and I think Jim Kunstler’s The Long Emergency sold two, three or four times what The Party’s Over did. But I think The Party’s Over appealed to folks who were perhaps a little more open to or interested in a communitarian response to the Peak Oil crisis. I’ve met thousands of people over the past decade who are doing amazing things in their own lives and communities and I feel very happy to have had some positive influence. Thank you. Well it certainly had an enormous impact on me anyway. And it had the best cover of any of the Peak Oil books as well!